LATINE CANO is a very different way to meet classical poetry. 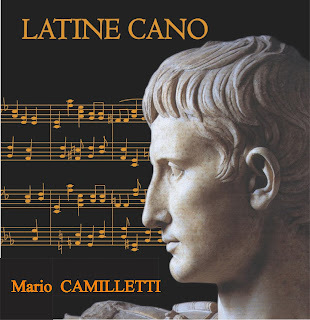 The composer, Mario Camilletti, teacher in an italian Secondary High school and musician, is truly convinced that the classical poetry was sung, not declaimed. To convince his students that Latin is the basis of our culture, he began to sing Latin poems in the way of modern pop music. With the music, you can hear and learn Latin classical poetry at the same time. You can try to sing some of the famous great poems by Horace, Catullus, Virgil, while keeping the latin metric, and meeting the classical in a funny but unforgettable way. Based on the Professor Camilletti’s experience, Latine Cano will show you how the Latin lirycs are new and adaptable also to modern pop music. MARIO CAMILLETTI, teacher of Latin and Italian Literature in Italy, has completed Classical studies at University “La Sapienza” in Rome and has studied Double bass at Conservatorio “Casella” in L’Aquila. He’s played with some of the best musicians and artists in Italy and he’s written and composed a lot of songs. He has written many books and articles and he has won some literary awards. For the italian tv he has made some works, like the documentaries “Voci” and “The Augusto’s songs”, released for the 2000 years since the death of the first Roman emperor. LATINE CANO was presented for the first time in Rome in the Campidoglio in 2014. Mr Camilletti realized this work playing guitar, piano, bass and cello. Collaborators: Javier Girotto (sax), Flavio Mazzocchi(piano), Max Rosati (guitars), Cristiano Micalizzi (drums), Martina Lupi (choir), Fabio Gagliardi (didjeridoo), Fabrizio Poletti (choir), Dario Fugalli (guitar).